Your journey starts on your mobile phone: Unlock your car and check your oil life – even before you sit in the car! The myOpel app for OnStar even helps if you have forgotten where you parked your Opel – just honk the horn and flash the lights remotely and let your car remind you. 1 The myOpel App features require an active OnStar account and are subject to mobile network and GPS coverage and availability. Terms and conditions apply. The OnStar Services require activation and are subject to mobile network coverage and availability. Charges apply after the free trial period. 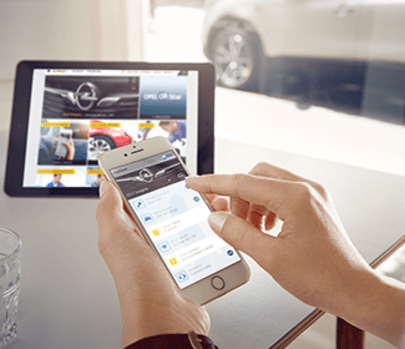 The OnStar subscription packages could be different from the services included in the free trial package. Some features may not be available for certain carlines or trim levels or OnStar packages. Terms and conditions apply. 2Remote Door Lock/Unlock is not available for Meriva. Click here for more information. 3An embedded Opel navigation unit and map data are requirements for Destination Download.